oatmeal by Nate Steiner is licensed CC BY 2.0. I had oatmeal for breakfast. Or did I? Is that all I really had for breakfast? Well, no - there was a pat of butter and a tablespoon of brown sugar in my oatmeal, plus I had a large cup of coffee with it. So, I really had a bowl of oatmeal with brown sugar and butter, plus a cup of coffee for breakfast. Clearly I must be hiding something. We must dig deeper. What time did I have breakfast? 11 in the morning? Well, that's not breakfast time - McDonald's stops serving breakfast at 10:30. So, clearly, I didn't have breakfast at all - I had brunch. 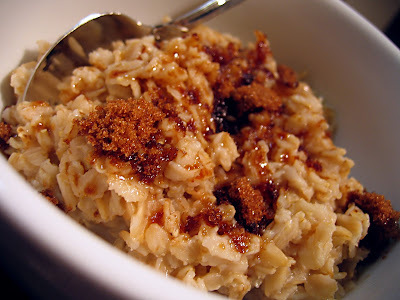 Therefore, I had oatmeal with brown sugar and butter, plus a cup of coffee for brunch. Clearly my story is unraveling. What do I have to hide? You know what else waits a long time before meals and eats later in the day? Reptiles. Snakes famously eat large meals, then digest them for a week. Snakes don't eat breakfast, lunch and dinner the way we do; neither do other reptiles, since they're cold blooded and don't need as much energy as warm blooded mammals. Isn't it a little suspicious that I don't seem to need as much energy as your average mammal? Isn't it a little suspicious that I overslept through breakfast and don't have as high of a metabolism as your average human? Isn't it a little suspicious that I've never openly denied being a Reptilian? I've lied about everything else - what I had for breakfast, or whether I even had breakfast or not. I've been evasive about everything else - I won't let anyone verify my claims about my so-called "breakfast" independently. What do I have to hide? What? I'm just asking questions. The truth is, I really did have oatmeal for breakfast, at least in the conversational sense of talking about "oatmeal" and "breakfast". Trouble is, any moment in time is like an irrational number - if you examine any moment far enough, you get steadily increasing levels of precision without end. It's physically impossible to know "the full story" about anything because any story in any measurable moment in time is infinitely deep and infinitely wide. Do we look for "the full story" down to the subatomic level? Do we examine "the full story" in a cosmic sense? Do we even possess the ability to measure "the full story" in either extreme, or in any other extreme we can possibly conceive of? Of course not. All we can do is establish that any story is "true" up to a certain level of resolution, then decide which level of resolution we need to look at. Sometimes, it makes sense to decide that "π = 3.14", like if you're trying to calculate the area of a circle on a cocktail napkin at a bar to impress someone. Other times, it makes sense to dig deeper and declare that "π = 3.141592654", like if we're building a bridge and need "exact" measurements of load, stress, and dimension. What we can't do - what we must never do - is decide that, since π does not, in fact, equal 3.141592654 - since, if we dig deeper, it actually equals 3.1415926539 - then "the story of π" must be all wrong and π actually equals 2 or 5. No amount of digging and analysis changes the simple fact that π equals "roughly 3", or "roughly 3.1", or "roughly 3.14", or so on. Proving that the 4 in the billionth's place is "secretly" a 3 because the number in the ten-billionth's place is a 9 does not destroy the truth of π or the truth of the values of the more significant digits, nor does it prove that there's a conspiracy to hide "the real value of π" from anyone. Similarly, proving that I didn't have plain oatmeal doesn't disprove that I had oatmeal - it just means you discovered a less significant digit in the story of my breakfast. Whether that particular piece of data is still important when looking at the story of my breakfast is subjective - sometimes it is, sometimes it isn't. It might be significant if I was talking to my doctor about my diet and the doctor told me to cut sugar and fat out. It's probably less significant if someone asked me what I had to eat for breakfast to get a good idea of how hungry I'll be when it's time for lunch; on the other hand, the fact that I had breakfast at 11 might be worth mentioning, or it might not be if I didn't have much oatmeal because I knew I'd be eating lunch a couple hours later. Either way, no amount of questioning or investigation will empty my stomach, turn me into a reptile, or make the ratio of a circle's circumference to its diameter 5. It can't be done. Don't let anyone else tell you otherwise.